Miniature 60's-70's Vintage Colorful Plastic Fully Dimensional Guns Handguns Revolvers Pistols Gumball Prize Vending Novelty Charms, approx. 2-inch (5cm) long. Great for any Punk COWBOY or COWGIRL! 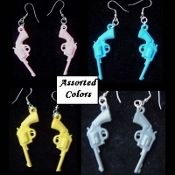 1-Pair, assorted color only.